A Healthy Vegan, Gluten-Free, Oil-Free Pizza…. That Actually Tastes Good! There’s a lot of gluten-free ‘healthy’ food options out there now, but the thing is, a lot of them also taste like cardboard…. If you’re on a new year’s health kick and missing your favourite pizza, there’s good news…. You can still eat pizza and keep those new year’s good intentions! This recipe provides all the nutrients and none of the naughtiness that most pizzas come loaded with…. In fact it’s not naughty at all, since the base is full of fibre, natural plant protein, and not one spec of processed ingredients! There’s a lot of joy to be had in hand-making your own meals, especially ones that usually turn up at your door delivered in a box…. By preparing everything yourself, not only do you know exactly what you’re putting into your body, but you’re able to create something completely unique and share the energy you put into making it with others. Two meals may look and taste exactly the same, but the way they’re prepared can enormously effect the way we feel when we eat them…. If you’re in a bad mood, rushing around the kitchen and thinking about something negative while you’re cooking a meal, that energy is passed into the food you prepare. Sounds a little bit crazy I know, but think how different you feel when you eat a meal which has been lovingly prepared by someone, compared to some fast food which has been slapped together in two minutes. In many communities who practice meditation and mindfulness, the kitchen is a sacred space in which only a select few people are permitted to enter. Meals are prepared in a positive, calm atmosphere with plenty of love. This is another way we can bring our practice of yoga and mindfulness off the mat and into life, just by taking time to become more aware of our actions as we go about our day…. – Vegan cheese – sprinkle on nutritional yeast, which has a good amount of vitamin B12 – essential in maintaining a healthy nervous system, keeping energy levels high, and protecting against high blood pressure. – Anything you want, to be honest…. Pour the ‘flour’ into a large bowl, and add the chia seeds, oregano, optional chilli flakes and smoked paprika and finally the water. Mix everything well until a thick, dough-like mixture forms. When everything resembles a pizza-dough-ish texture, take the mixture out of the bowl and handle to ensure the ‘dough’ is well combined and soft. 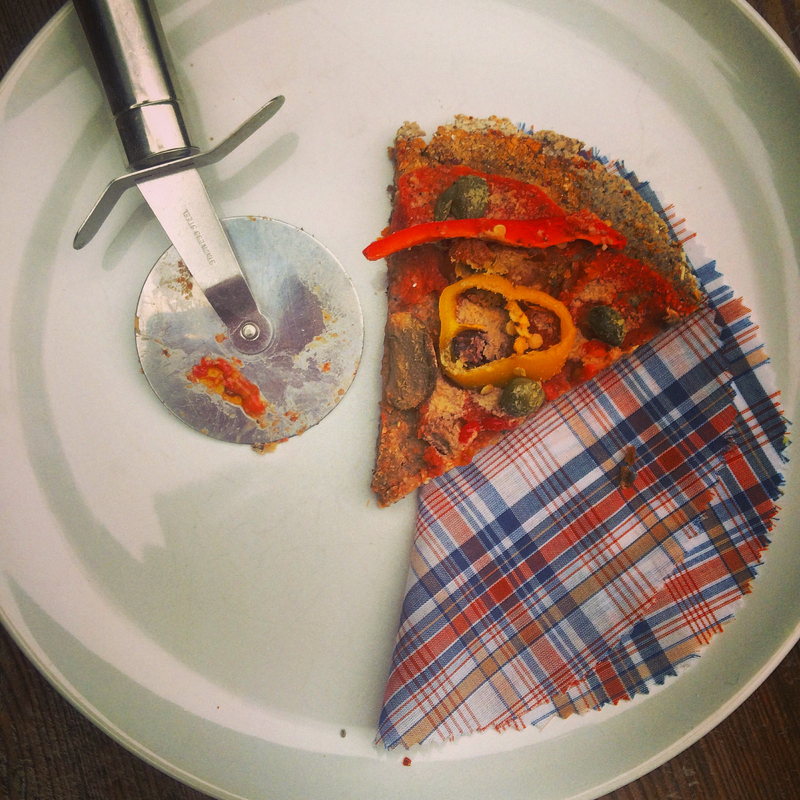 I wouldn’t recommend throwing it around and being any sort of fancy pizza chef here as it isn’t likely to end well…. Place the dough onto a chopping board or clean surface (sprinkle with a little of your buckwheat and oat flour if you have any left to stop anything getting stuck to the surface) and roll flat into a circular shape (or square, or triangle, no one says your pizza has to be round….) keeping the edges about 1cm thick. Place on a try in the oven and bake for 30-40 minutes until firm. When ready, remove from the oven and either leave to cool until you’re ready to add your toppings later, or add them straight away and bake again for around 10 minutes.This is enough to serve 2, so you can share your healthy pizza with someone else who’s missing takeaways!